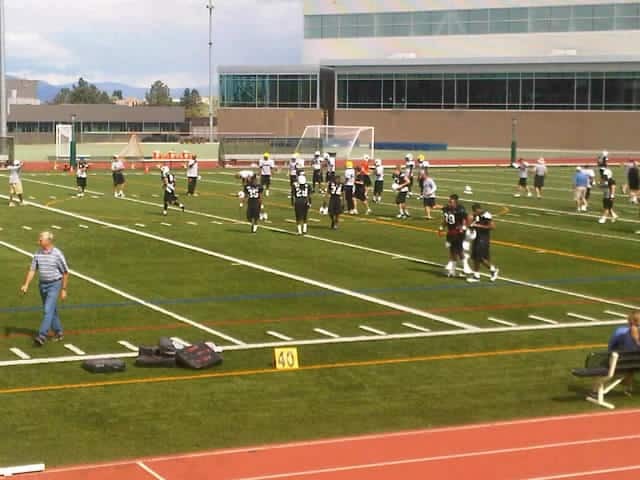 Welcome to the live blog of the June 7th afternoon session of BC Lions training camp in Kamloops, BC! Keep checking back here for live updates. The morning session was a physical one and it will be interesting to see how the coaches handle this practice. 4:00pm: The team has taken the field and are working on group drills prior to warming up. 4:19pm: The team is just going through stretching. Drills to start soon. Perfect weather for football. Warm but not hot, nice breeze. 4:34pm: More positional drills, working our way up to scrimmage mode. Much “lighter” practice than the first three sessions so far. 4:36pm: Enough about Matt Chapdelaine not deserving to be here. He has the tools and hasn’t looked out of place at all. Took a big hit yesterday too. 4:47pm: The offensive line has joined the rest of the offence and the unit is running plays. Jarious Jackson at the controls as first and second teamers rotate in and out. 4:59pm: Team working on running plays, Jamal Robertson getting most of the touches. Travis Lulay getting some work. 5:02pm: Now the intensity is picking up. Heavy weight champ Sorensen getting “challenged” by Arakgi. 5:05pm: Carlton Medder doing a nice job on consecutive plays keeping Keron Williams toi the outside. 5:08pm: Rasouli and Gesse exchange words after banging heads on two plays. Rasouli asserts his dominance of the rookie. Lulay picked off by Korey Banks. 5:11pm: Travis Lulay is struggling and he’s got the starting receivers to work with. 5:14pm: Kyle Parrish getting some reps now with the rookies…and that’s the end of that. Printers and the starters back in. Notes: Domini Pittman, Richard Jones, Elimimiam and Dominic Bolden sitting out practice as well as McKenzie again. 5:46pm: After some field goal practice Coach Buono tells the players to remove their pads for no contact scrimmage. 5:47pm: Emmanuel Arceneaux is going to be a beast this season. Take it to the bank. BEAST! 5:54pm: The first offense is struggling with the passing game. Printers finally connects with Jackson across the middle for a nice gain. Play action results in another nice gain to Washington, who like he has all camp makes the catch. Printers finally connects deep with Passmore. 6:00pm the second teamers getting some reps to close out practice. Rain beginning to fall in Kamloops. Practice called. A much less physical session, likely Due to the coiaches sensing the need to throttle things back a bit. Tough to get a read on things with the lack of hitting this afternoon. Photos of both sessions coming tonight.